At the moment we received the SBH-100 I wished to read a bit more than is provided in the manual and on the box (there is the minimum of technical data and mostly practical advices are provided). Search in the Net gave many results, but the name of SBH-100 belonged to another product by a small manufacturer. The SBH stands for Stereo Bluetooth Headset, and the number specifies the generation and the position of the device in this generation. The number of 100 can be decoded as the first generation, and double zero means the starting position. 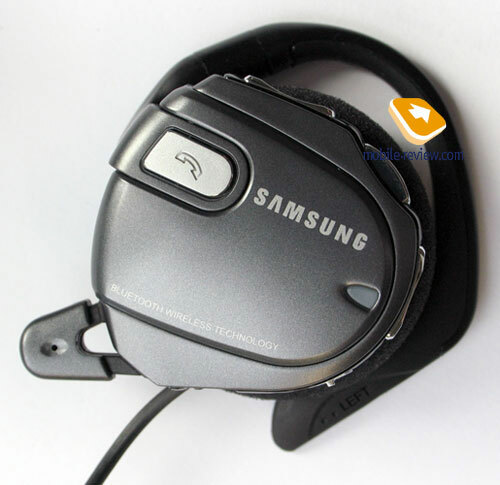 And really that is the first headset in this form-factor by Samsung. First, it was produced for the home market and then they decided to ship it to Europe, good no localization is required (except for the translation of the manual). To tell the truth, the package doesn't really amaze. 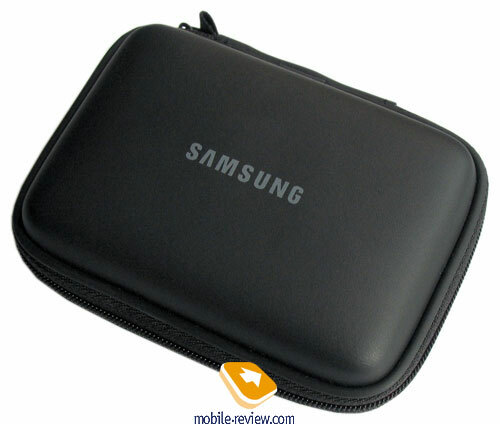 It contains a charger (a thin prong) a manual and the headset in a small case. You can't place the headset and the charger into the single case at the same time - the case is intended for the headset only. 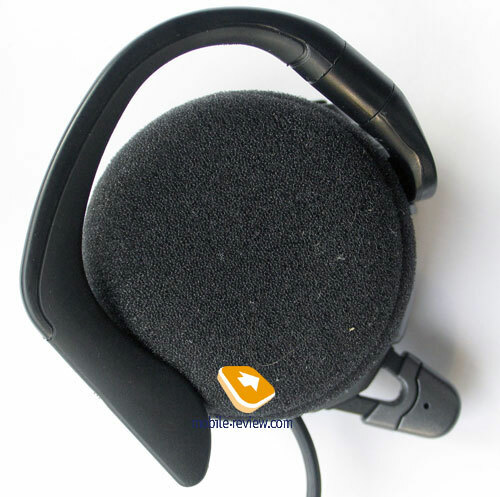 The construction of the headset is interesting since it is represented with two quite massive blocks connected with a thick wire, which can go behind your neck or before your chin. Just as you like. Each headphone goes with a special cloth closing the loudspeaker. The holders are rather tough, but from the inside the material is softer. 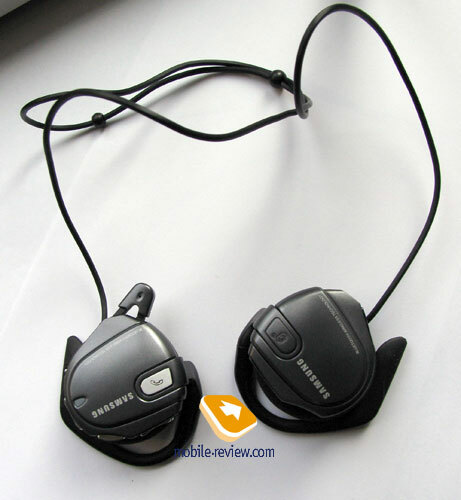 Big diameter of the headphones allows various people to wear them comfortably, the fastening is reliable and the headphones do not fall down at run or jumps. The left side holds all the functional keys, a projection here is a directional microphone. 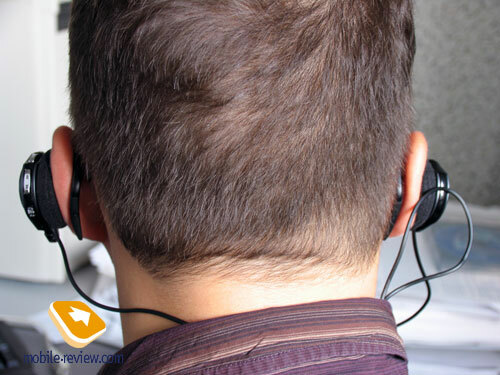 Considering the headset is much distanced from your mouth, do not expect good work of the microphone. 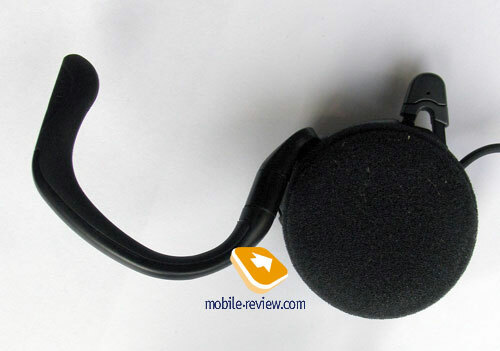 In fact, this headset proved itself like other one-ear headsets, the microphone sensitivity is comparable. That means indoors or in a card with windows closed, you'll experience no problems, at the same time, in the street with a crowd around you will find hard to make a conversation. The control elements are really comfortably placed. Dialing the last number is possible with the side button, and by the way it is responsible for answering a call or canceling it. An indicator is placed on this very side. When working, it shines with blue, and at charging shines with red. On the top of the side surface (when worn) you'll find a coupled volume button, and a bit lower a "play/pause" button is placed. The last button allows rewinding a composition towards or backwards (inside a composition no rewind is possible). Finally, in the very end there is a headset on level, and lower see a charger connector (it is covered with a sliding shutter). You'll deal with the control elements at the very first day, no problems appear, and your finger will lie exactly where you want. 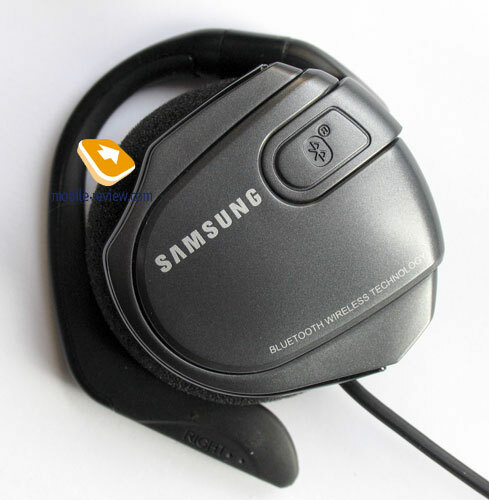 The general headset ergonomics is perfect and comfort of using it is high. The appearance seemed quite good (still only a black variant is available), however some people may consider external headphones too defiant and noticeable. Coupling with a phone will cause no problems, just press a side button and turn the accessory on. 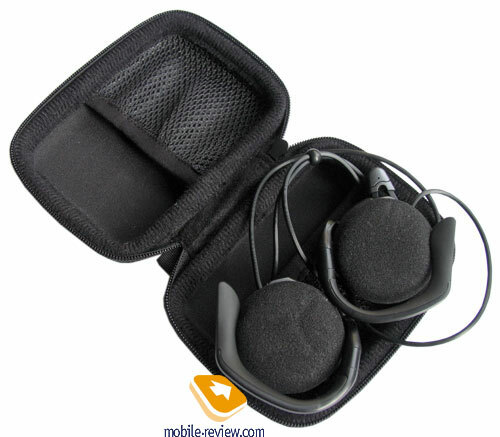 The pin code is standard - 0000, and the headset can remember up to four last devices. 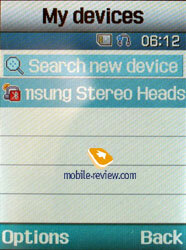 The compatibility list includes only models supporting A2DP profile, among Samsung phones they are D600, E750/E760, I300, and some CDMA models. 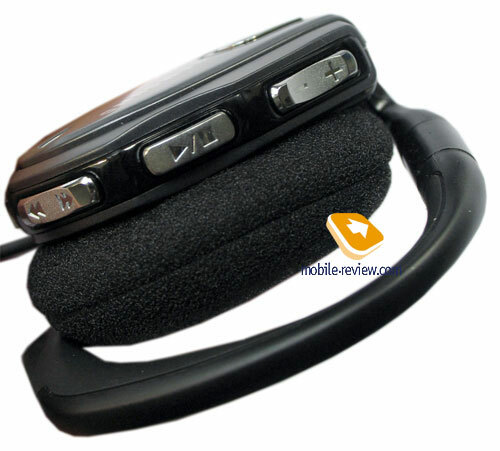 Also we tested the headset with a PDA run by Windows Mobile (new drivers by Broadcom) and explored no problems. We connected to the Internet radio station via Wi-Fi from the PDA and transmitted the sound to the headset. Then we could stop playback, but general control was inaccessible (everything works well when playing with a standard player). 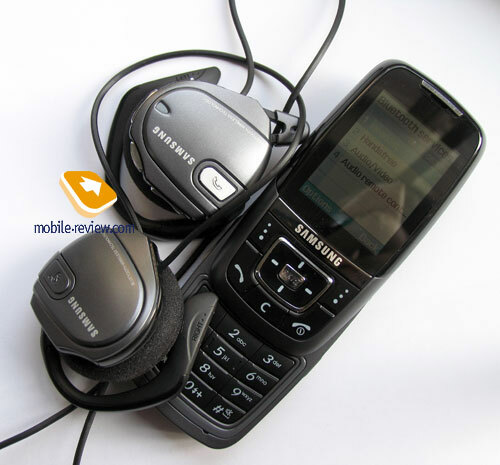 No problems appear when working with a usual phone; we tested the device with Samsung D600. In the player menu you select "use headset" for playing (both mp3 and sounds from video are transmitted), the device alerts the composition will start from the beginning. Then sound appears in the headset, and you can listen to the music via it. The playback volume is beyond praise - we advise to listen half-loud, otherwise you take a risk of getting deaf. The maximum level is suitable for listening at a building site, but then doing harm is very probable (take the headphones off, and you feel the cotton-wool-like effect). Full recharging will take you a bit more tan an hour. Unfortunately, we couldn't find the battery specs. 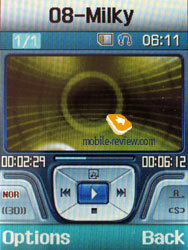 In the max volume mode, the headphones allow about 10 hours of non-stop playback (about 2 meters distanced from the phone). 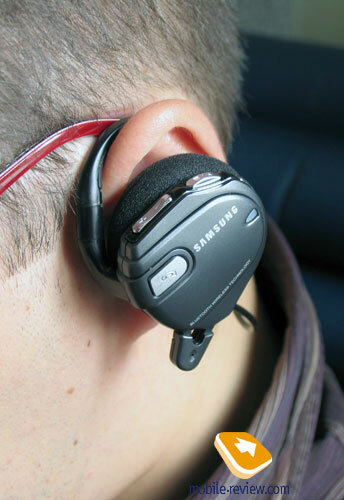 The effective distance of the headset reaches 5-6 meters; this allows listening to the music with no noises and breaks. In the standby mode he headphones work for about 4 days. At combined use (working with the phone, about 1.5 hours of music a day), the earphones work about 2 days. The real weakness of the couple is the very phone. In the D600's case a completely charged battery discharged totally in 3-3.5 hours of listening to the music. And the same results the I300 and E750/E760 showed. The battery area in the phone heats up much during data transfer to the headset. 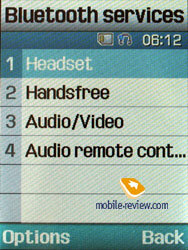 The headset is hardly compatible with other devices not supporting A2DP profile; however, there is no need in using this headset with them. 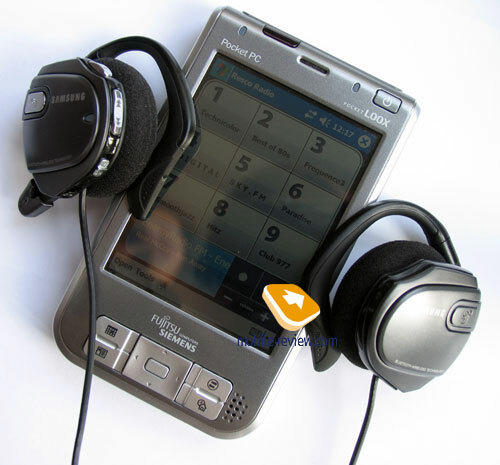 For instance, SE K750i connects to the headset, but at a call no sound is transmitted to the earphones, the device warns about a connection mistake. The confection and sound transmission qualities are high. We can't say practice makes perfect about the Samsung's solution, as it is the best in its class for today. The arts samples by Chinese and Taiwanese companies we held before are not even worth a piece of news due to bad quality in work and coarse assembly. And that is even stranger considering that many announcements of alike products starting with March. As for Samsung, we see no sensation about the product launch. There are no rivals still due to the absence of any alternative devices. In the end of October, the SBH100 will be shipped into the market for the price of 140-150 USD. The cost seems right for this class and set of characteristics.